One of the main cultural phenomena of 2013, at least from my perspective, was a welcome move towards telling the history of the HIV epidemic, and in particular looking back on the key years of the 1980s and early 1990s, especially in the US. This started with the fantastic documentary How to Survive a Plague, directed by David France, focusing on the story of ACTUP activists in New York City. I wrote earlier in the year about how powerful this documentary was – almost 10 months later and I would still say this was the best, and most important, film I saw this year. Which is not meant as any disrespect to the also rather wonderful All the Way Through Evening, directed by Australian Rohan Spong. This documentary presented a much more targeted examination of the impact of HIV, through the story of Mimi Stern-Wolfe, an incredible woman who, each year, organises a concert in New York which plays the music of composers lost to AIDS-related illness. In theatre, I finally fulfilled a long-held ambition by seeing the Belvoir St revival of Angels in America: A Gay Fantasia on National Themes. Staged 20 years after Tony Kushner’s 2-part epic first debuted, director Eamon Flack, and indeed the entire cast, did a brilliant job of making the pain, and fear, and hope, and hopelessness, seem all too real (which is a pretty decent effort when the plays ask the audience to suspend their disbelief about angels suspended on ropes, or in this case, standing on stepladders). It was also a privilege to see the 7-hour marathon (we saw Millenium Approaches and Perestroika back-to-back) with my fiancé Steven. Not normally a fan of theatre, he was as engrossed as I was by this production. More importantly, these films and plays served as a ‘history lesson’ for both of us. Steven was born in December 1983, after the first deaths from AIDS-related illness in Australia. His entire life has been in the shadow of this epidemic. Even though I am (*cough*) a little bit older than that, I still turned 18 after saquinavir and ritonavir had been approved by the FDA in the US, fundamentally altering the nature of the epidemic for the better. It feels right that all generations of gay and bisexual men, and indeed all people potentially affected by HIV, should take the time to reflect on the history of this epidemic. That we should remember the people who fought to overcome stigma and discrimination, who fought for better access to treatment, who fought for the right to survive. And of course it is vital to remember the personal stories of those who lost their own fight. But it is also vital that, in doing so, we do not lose sight of the challenges that remain. Because the activists of yesterday might be somewhat disappointed in us if we did not also fight the battles of today, and tomorrow, with the same conviction that they did. This includes tackling the stigma and discrimination against people living with HIV that continues to exist in our society. And working hard to help prevent new transmissions – something that was thrown into sharp relief by recent figures which showed that HIV notifications increased 10% nationwide in 2012, including a jump of 24% in NSW. Above all, the global challenge of HIV is in ensuring that all people have access to effective treatments, irrespective of their race, sexual orientation or gender identity, their class or their nationality. Cost should not be a barrier to receiving the latest drugs. Indeed, access to treatment must be considered a fundamental human right. Hopefully, Australia can play its part in the reinvigoration of this fight as it hosts the AIDS 2014 conference in Melbourne next July. In the meantime, the recent trend towards (re-)telling the history of HIV on stage and on film, which arguably started with We Were Here back in 2011 (about the impact of HIV on San Francisco), shows no signs of letting up. Next month, Jean-Marc Vallee’s Dallas Buyers Club will hit our cinemas. It is reported that John and Tim, a documentary about the life of the author of the memoir Holding the Man, Timothy Conigrave, and his partner John Caleo, will also be released early in 2014. [Incidentally, that book was the first I read as a young gay man, and remains my favourite to this day]. Just this week, director Neil Armfield received Screen Australia funding to develop a film version of Holding the Man, based on Tommy Murphy’s 2007 stage adaptation. The Hollywood version of Larry Kramer’s largely autobiographical 1980s play The Normal Heart looks on track for a 2014 release, too. Which, in a way, brings us all the way back to How to Survive a Plague. The scene of Kramer sitting in a room full of divided and dispirited activists, yelling “Plague!” is the one that has stayed with me above all others. One day, the epidemic that is the Human Immunodeficiency Virus will be over, in part because of the work of ACTUP activists and others like them. Til then, we must keep remembering, and keep fighting. So, last Sunday Steve and I had the privilege of watching the documentary How to Survive a Plague at the Mardi Gras Film Festival, presented by Queer Screen. I say privilege, because this is both one of the best, and one of the most important, documentaries that I have ever seen. This blog post is my way of saying thank you to director David France for putting this documentary together, something which must have been an incredibly difficult thing to do, because of the subject matter involved, and because of the heavy responsibility of portraying the people and events involved honestly and respectfully. 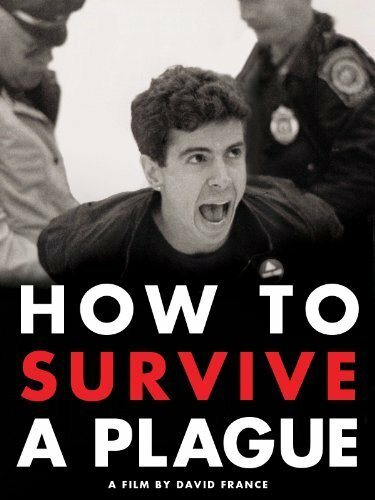 How to Survive a Plague chronicles the activities of ACT UP (the AIDS Coalition to Unleash Power) and its off-shoot TAG (the Treatment Action Group), from the epicentre of the AIDS crisis, the gay male community in New York City in 1987, through to the introduction of protease inhibitors/triple combination therapy in the mid-1990s. I must admit that I cried (well, more accurately, sobbed) at many points during this film, from the visceral sense of fear experienced by these men and unflinchingly projected through the screen, through to the wonderful moments of comradery as they fought for and often won small victories in their long (and ultimately, but much too late of course, victorius) war for fair treatment, and including the tragic loss, too soon, of crusaders like Ray Navarro and Bob Rafsky (the scene with his ex-wife and child in the church after his funeral is especially raw). Many direct action protests are captured, including the October 11, 1992 political funeral in Washington DC (where activists scattered ashes of the fallen on the White House lawns), and then the funeral of Mark Lowe Fischer in New York just before the 1992 Presidential election, where they took the open casket and chanted pleas for the polical class to listen and do something, anything, right outside the Republican Campaign Headquarters there. But it is two speeches which for me truly stood out. The first, the amazing speech by Peter Staley to the International AIDS Conference in San Francisco in 1990. That speech is just about perfect in terms of political oratory, conveying a message while also grabbing the audience and forcing them to take on as their own the opinions and priorities of the speaker. The second, more ‘impromptu’ speech, is heart-breaking because of the sense of disunity and despair it revealed – I dare anyone not to be jolted out of their seats when they see Larry Kramer yell ‘Plague!’ to a room full of activists, who are themselves depressed and divided about the scale and severity of the challenge confronting them. Of course, the documentary ends on a relatively positive note, as we see many of the activists from the archival footage, alive and now doing other, very worthy things with their lives (like most audience members I am in awe of the capacity of people like that to have fought such a long campaign, and then to sign up for one or indeed several more eg Mark Harrington, Peter Staley). But just because many people in the Western world, and some in the developing world, are doing well health-wise in the fourth decade of the HIV/AIDS epidemic, does not mean that we can’t do better, both in terms of reducing transmission, and increasing access to treatments (and ultimately, of course, to finding a cure). And the fact that as a society we are now doing comparatively well on this issue is the exact reason why we should watch movies like this, to reflect on the battles fought that got us here, and to thank and pay tribute to the activists who gave so much to ensure that people who followed would have a better, and more hopeful, existence. My fiancé Steve and I went to Queensland last week on holiday. The main purpose was to attend my mother’s 65th birthday. However, we also decided to treat ourselves to a night in Noosa, and to a massage the following morning, so that we could both de-stress. I could not believe my eyes. First, I find it difficult to understand how a massage could involve any risk of HIV transmission (given there is no exchange of bodily fluids or other means of transmission). Second, and much more offensively, I can’t recall the last time I saw someone use the phrase AIDS as shorthand to refer to someone who may be HIV-positive. In fact, it may be more than a decade since I saw the conflation of the two, especially on a document which has probably been distributed hundreds if not thousands of times. I was too shocked to raise the issue at the time, but did take a copy of the form to use as the basis of a complaint to the company which provided the massage. I have written the below email to the company outlining my concern with the form. I have also copied this email to the Queensland Association for Healthy Communities for their information (and possible follow-up). At this stage, I am giving the company the benefit of the doubt. I am hoping that it may be an ‘innocent mistake’, and that they do not understand how offensive this form is. As such, I am not naming the organisation on this post today. Nevertheless, should they fail to respond positively to this complaint, or fail to respond at all, I will of course name the company involved so that other fair-minded people can avoid them when they go on holiday and want to relax. After all relaxing is far more enjoyable without an added dose of unjust discrimination. I am writing today to raise an issue which occurred during my massage at your premises in Noosa last Friday October 12th 2012. In particular, I am referring to your Client Form, which I was required to fill in before having my massage. This form included a section headed “Please circle if you have any of the following” and one of the options listed was “A.I.D.S”. I find this inclusion to be incorrect and offensive. First, I imagine that this question was seeking to establish whether a client potentially has a blood borne virus (in this case HIV, not AIDS). I also imagine that this question is at least intending to ensure the massager is able to take appropriate precautions regarding this blood borne virus – although I am having trouble working out what precautions would be necessary given massages do not involve an exchange of bodily fluids and I cannot think of another way of possible transmission that is relevant in this situation. Could you please enlighten me what the response would have been by your company if someone had circled the response “A.I.D.S”? Is this response supported by scientific evidence and/or advice from the Queensland Department of Health? Second, and much more importantly, I would like to point out that there is a difference between someone being HIV positive, and someone who is currently experiencing AIDS. While you must be HIV positive to experience AIDS, there are many, many people who are HIV positive who do not experience Acquired Immune Deficiency Syndrome. Conflating the two conditions, or using “A.I.D.S” as shorthand for all people who may be HIV positive, is extremely offensive and unnecessary. It reflects thinking from the 1980s and not 2012. Ironically, if you seeking to protect your employees, the way that you are asking this question may not achieve what you want in any event – if someone is HIV positive but does not have AIDS, then their correct/factual answer would be to leave “A.I.D.S” un-circled. To rectify this situation, I would ask that you please consult with the Queensland Association for Healthy Communities about both your responsibilities in this area, and, if you must ask people whether they have a blood borne virus, how that information should be sought from the client. I have copied this email to them for their information and follow-up. I look forward to your reply to this email, including the actions that you have taken to amend this form.